Schematic of transport of neonicotinoid insecticides from the field, where they are applied as seed treatments, to a nearby stream. Photo credit: Dana Kolpin, USGS; Illustration credit: Yvonne Roque, USGS. Three neonicotinoid insecticides (clothianidin, thiamethoxam and imidacloprid) were detected commonly throughout the growing season in water samples collected from nine Midwestern stream sites during the 2013 growing season according to a team of U.S. Geological Survey (USGS) scientists. Clothianidin was detected most frequently (75 percent) and at the highest maximum concentration (257 nanograms per liter [ng/L]); thiamethoxam and imidacloprid followed with decreasing frequency of detection (47, and 23 percent) and maximum concentrations (185 ng/L, and 42.7 ng/L), respectively. Two other neonicotinoid insecticides, acetamiprid and dinotefuran, were both detected only once, and a sixth, thiacloprid, was never detected. The nine stream sites are located in the Midwest, in the area of highest use of neonicotinoid insecticides in the Nation. Water samples were collected monthly from March/April through October at eight of the nine stream sites. The remaining site was sampled more frequently to determine the variability of stream concentrations during the growing season and rainfall events. The stream sites had drainage areas that spanned four orders of magnitude, indicating their presence in large as well as small watersheds. Pulses of elevated neonicotinoid insecticide concentrations were associated with rainfall events during and shortly after crop planting, which is consistent with the spring flushing of herbicides that has been documented in Midwestern U.S. streams. The insecticides also were detected prior to their first use during the growing season, persisting from use during previous growing seasons. Neonicotinids are a class of insecticides that are chemically similar to nicotine, and affect the central nervous system of insects. The chronic aquatic toxicity of imidacloprid is in the range of 10 to 100 ng/L. Clothianidin and thiamethoxam have a common mode of action and therefore are expected generally to have similar effect levels. Neonicotinoid insecticides are highly soluble in water and do not readily degrade in the environment, therefore they are likely to be transported away from the initial application area to surface water and groundwater. This study provides the first broad-scale investigation of neonicotinoid insecticides in the Midwestern U.S. and one of the first conducted within the entire U.S. Information on neonicotinoid insecticides in the environment is limited; additional information is needed on concentrations of neonicotinoid insecticides in streams and other environmental settings across the U.S., the potential environmental contributions from use as a seed treatment, and potential health effects on biota, including pollinators and aquatic invertebrates. In recent years, insecticide use on crops has changed dramatically in terms of both active ingredients used and application techniques. The use of organophosphate and carbamate insecticides has declined, while use of neonicotinoid insecticides across the U.S. on corn and soybeans has increased 10-fold over the last decade. There has also been a corresponding change in insecticide management techniques, which are switching from broadcast applications for insect control to the use of insecticide-treated seeds. The use of treated seeds in the U.S. has increased in the last decade to the point where most corn and soybeans planted in the U.S. have a seed treatment, many of which include neonicotinoid insecticides. 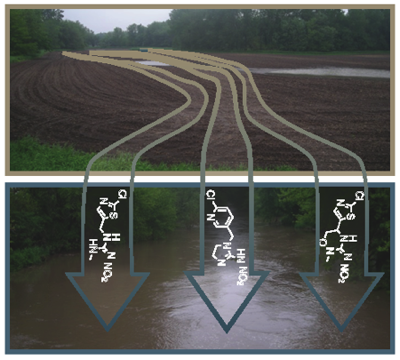 Widespread occurrence of neonicotinoid insecticides in streams in a high corn and soybean producing region, USA: Environmental Pollution, 2014, v. 193, p. 189-196, doi:10.1016/j.envpol.2014.06.033. Analysis of the herbicide diuron, three diuron degradates, and six neonicotinoid insecticides in water-method details and application to two Georgia streams: U.S. Geological Survey Scientific Investigations Report 2012-5206, 2012, 10 p.